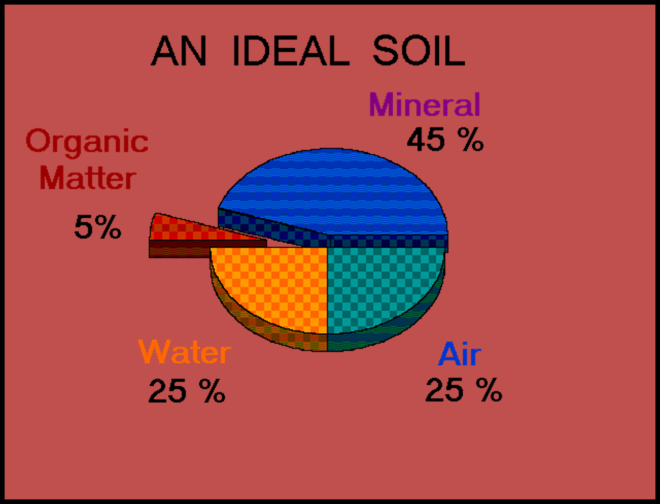 Introduction: An ideal soil is considered to consist of 45% mineral (sand, silt, and clay), 5% organic matter, and 50% pore space. The pore space provides the oxygen and water necessary for plant growth. Oxygen is necessary for root respiration with research showing the ambient air level (~21% O2) which we breathe is equally beneficial and even critical to plants. The lower the soil oxygen level the less root growth and the lower the chances of plant survival. . The balance between moisture and oxygen is critical. Without oxygen in the soil atmosphere, roots are unable to generate the energy necessary to develop and maintain roots. Without adequate moisture, roots dehydrate, nutrients are not absorbed and the plant dies. As roots use oxygen carbon dioxide is given off. Most soil microbes also use oxygen and release carbon dioxide. As the content of the CO2 in the soil increases microbes and roots shut down and/or die. For oxygen to enter the soil and carbon dioxide to leave, the large pores (macropores) through which gas exchange occures need to be continuous from the soil surface to a depth at least equal to the root depth of the plant. 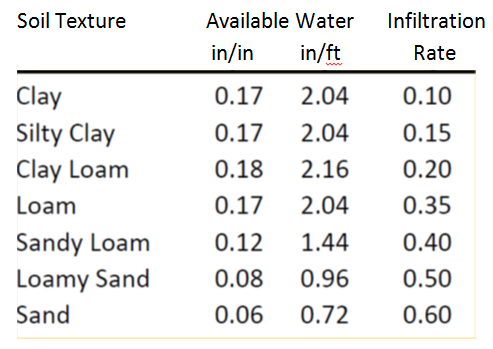 Soil Texture and water movement: The texture of a soil is based on the percentage of sand, silt and clay and the rate at which water moves into the soil (infiltration) is based in part on texture (Table 1). This is obvious when you consider water infiltrates a sandy soil faster than a clay soil. 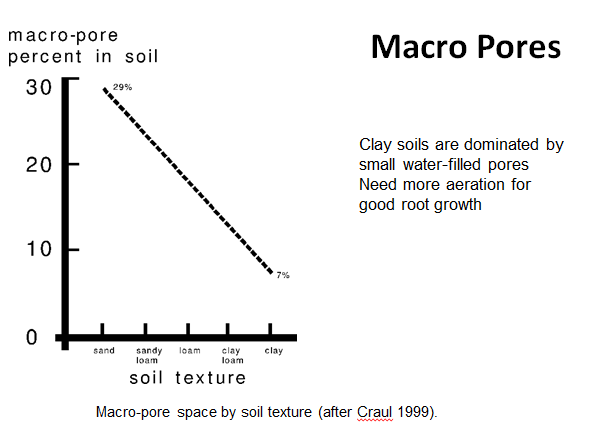 What is not so obvious is the fact that when water is applied in excess of the infiltration rate, separation of soil particles on the soil surface occurs and clay and silt particles flow into the pores between the aggregates blocking the larger pores (macropores) necessary for air flow into and out of the soil. When designing an drip or sprinkler irrigation system for the lavender plantation the application rate of the system and the length of time the system is set to run needs to take the infiltration rate into account to prevent oxygen deficient soils. Soil Structure: While we cannot easily change the texture of the soil, we can affect its structure. The structure of the soil, how clay, silt, and clay particles are combined into aggregates (little clods), impacts water and oxygen movement into and through the soil. Our goal as growers is to enhance the development of macropores that ensure proper drainage of excess water out of the soil. These pores also improve the ability of oxygen to move into and carbon dioxide out of the root zone. Macropores: Macropores are the diameter of a human hair or slightly larger [60 µm (microns) or larger]. 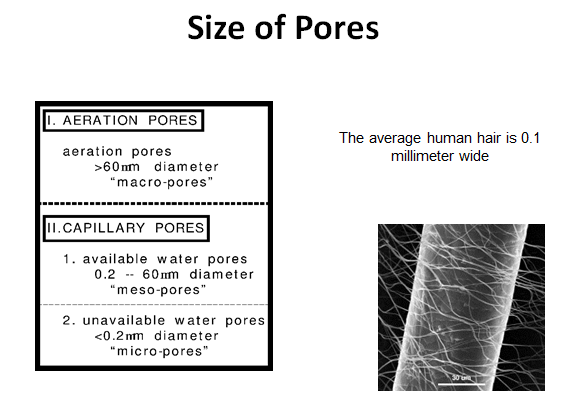 Smaller pores (between 60 and .2 µm) are called mesopores and contain plant available water available. Micropores (smaller than .2 µm) hold water with such great tension, plants are unable to ‘pull’ it from the soil particles. Root pathogens become more virulent. Some root pathogens actually swim toward roots surrounded by a high carbon dioxide/ low oxygen content. Roots lose their ability to use the carbohydrates produced in the leaves to generate the energy necessary to absorb nutrients or produce the products necessary to prevent root disease pathogens from causing problems. Roots lose the ability to absorb water even when the soil moisture content is adequate. This is due to the enhanced development of a waxy layer called the ‘Casparian Strip’ around the center of the roots which water must reach to be transported to the top of the plant. Roots lose the ability to absorb certain nutrients. Metabolic activity, i.e. burning of carbohydrates in the presence of oxygen, is necessary to provide the energy for the active uptake of nutrients such as phosphorus, potassium, nitrogen, iron, magnesium, etc. Soil microbes decline in concentration. This includes bacteria which colonize the root tip and provide protection from pathogens and enhance root growth. Mycorrhizal-forming fungi which form a symbiotic relationship with the roots of lavender also decline in concentration when oxygen levels are low. Soil Amendments: Organic Matter: Adding coarse compost, wood chips, or bark mulch to soil helps generate the resins necessary to form soil aggregates and create macropores. Organic matter enhances soil microbial development helping bind soil particles into aggregates. The amount of organic matter to add and the depth of tillage into the soil often determines the length of success of the lavender plantation. Fine materials should be avoided when amending the soil as these contribute to the plugging of the macropores. Avoid the use of organic matter, especially manures, excessively high in soluble salts. Lavandula will tolerate levels up to 9 dS/m (mmhos/cm) but some manures have salt levels well in excess of that level. Nutrients: The nutritional status of the soil is less important than improving the structure or preventing root rot but is still important. As with any woody plants the amount of nitrogen, phosphorus and potassium and micronutrients in the soil is important. Most research reports the addition of one pound of N per 1000 square feet prior to planting is important with more applied after harvest, but that depends on the N status to begin with. A soil test will provide you the amount of N present but not always the amount you need to apply. Nitrogen, whether of synthetic or organic origin, should never be applied after mid-season as this can result in stimulating growth which will not acclimate properly for winter resulting in winter injury. When you have your soil tested, be sure the laboratory provides you recommendations specific to Lavandula. Additions of phosphorus (P) must be based on a soil test. While you have undoubtedly heard phosphorus enhances root growth this is only true if phosphorus is deficient and only a soil test can tell you if P is deficient. When adequate phosphorus is present adding more can result in tying up iron and other micronutrients and reducing the effectiveness of the symbiotic mycorrhiza that benefits Lavandula. 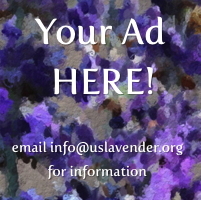 Lavandula is a mycorrhizal plant, it requires this fungus to be alive and symbiotic. Applying phosphorus when P is not needed can turn the symbiotic fungus into a parasite. The amount of phosphorus in a soil sample is determined using different extraction techniques. The lab should be able to provide you recommendations for any P deficiency noted. My previous USLGA article on Phosphorus and Lavender provides details on soil testing and phosphorus requirements. As with phosphorus, adding potassium or any micronutrient (iron, zinc, magnesium copper, etc.) when not needed can cause imbalances and do more harm than good. Soil testing is the best way you can determine if your soil has the nutrients necessary for the production of lavender. Soluble Salts: A soil test will also provide the E.C. of your soil. E.C stands for electrical conductivity and tells you the level (content) of soluble salts in the soil. Except in rare situations, the salts that will be included in this number will be calcium, potassium, and other salt combinations. Lavandula are tolerant up to about 9 mmhos/cm (dS/m) based on the saturated paste extraction technique. Many soils labs use a 2:1 volume/volume water to soil, or 1:1 v/v water to soil extraction technique. They are much faster than the saturated paste technique and thus less expensive to run. Depth of Preparation: The depth of proper soil preparation in part determines winter survival, nutrient availability, and potential for damage by spring frosts and summer droughts. All of these directly impact yield of floral stems, buds, and essential oil/hydrosol. Shallow soil preparation equals shallow roots and plants with shallow roots are more susceptibility to summer droughts. They also tend to break dormancy earlier in the spring than plants with deeper roots. When plants break dormancy early they have a greater possibility of experiencing damage from spring frosts.When your soil has been tested using the 1:1 technique, the number the report provides needs to be multiplied by 3 to convert it to saturated paste; if the 2:1 technique was used, multiply the number by 2.5. If the number you have after conversion is close to or higher than 9 you will have problems growing lavender unless you properly amend the soil and leach (wash) the salts out of the soil prior to planting. A soil with a high E.C. pulls moisture out of the roots due to reverse osmosis. In some cases you will be unable to leach the salts out of the soil. This can occur when you have a water table within three feet of the soil surface. Installing a drain system below the water table may be your only option if you continue to want to grow lavender. If your soil has a high salt level and the water table is below three feet you should be successful with Lavandula as long as you improve the soil structure and leach the salts out of the soil prior to planting. Use of Mulch: Even when the soil is prepared properly as descried above, heavy rains and excessive irrigations in excess of the soil’s ability to absorb water, soil aggregates are broken down into their individual components of sand, silt and clay. The finer silt and clay particles form a film on the soil surface sealing the surface of the soil causing puddling of water and preventing air from moving into the soil. Applying organic or mineral mulch on the surface of the soil helps break the destructive force of rains and irrigations preventing the breaking apart of soil aggregates keeping those important pores open. Plastic and Landscape Fabrics: Placing a layer of plastic or landscape fabric over the soil can hamper the movement of oxygen into and carbon dioxide out of the soil. Landscape fabric, while designed to allow water and oxygen to pass through its pores, can be plugged over time by dust that blows onto the field or from clay or silt in the soil. Growers should check landscape fabric yearly to determine if air and water can still penetrate. This can best be determined by apply water to a piece of new fabric and observing the movement of water through the fabric. Do the same with fabric that has been in place on the soil and compare the difference. If water movement through the fabric is significantly hampered, removal of the fabric to prevent root rot should be considered. Avoid pulverizing the soil and turning macropores into smaller pores. Never work the soil when it is wet. This destroys structure. Use amendments such as compost, wood chips, bark mulch, etc. These will continue to decompose and create the resins necessary for improved soil structure. Microbes feeding on these organic amendments also help soil form the aggregates needed to allow water and oxygen to penetrate. Regardless whether the soil is sand or clay, organic matter is recommended. Use organic matter that is somewhat coarse. Finely ground organic matter blocks macropores while coarse material holds macropores open. Avoid the use of organic matter that is high in soluble salts. Manures contain salts and may increase the soil salt level when used as mulch or soil amendments. This elevated salt level can be a serious problem when the resulting soil salt level is greater than the salt tolerance of the plant. While lavender will tolerate a soluble salt level of up to 9 mmhos/cm (saturated paste technique), health and yield are negatively affected prior to reaching this level. 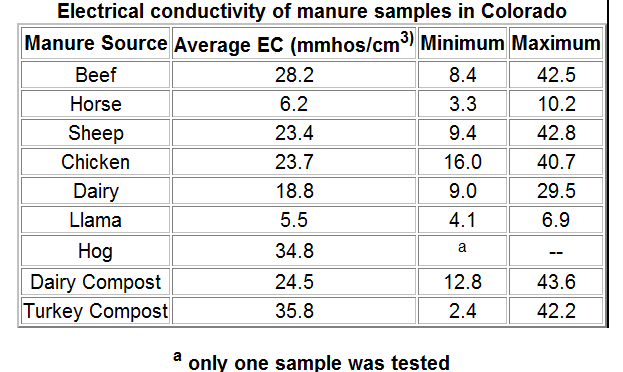 See Table 1 for the salt level of various manures. .
Test the soil to determine what nutrients are deficient and if the soluble salt level is excessive. Make the necessary correcting prior to planting. Planting Lavandula. on raised beds increases the chance for drainage of excessive amounts of water as can occur during the rainy season or when irrigation systems schedules are incorrect. Planting on raised beds can reduce chances of root rot.